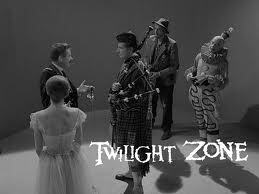 We watched another Christmas-themed Twilight Zone episode last year, and thought it was pretty decent. This one was slightly less good, but still okay. Actually, knowing that this is a Christmas episode has a decent shot at giving away the twist, but it’s not that awesome of a twist. The plot, such as it is, follows five amnesiac strangers who are trapped in a featureless room together. They know their occupations, they know a little about the world, but they don’t know who they are or how they got there. The Army Major is the most recent one to arrive, and he pushes the others to try various crazy escape plans. The rest of them seem rather content to just pass the time. Some of the acting is pretty interesting, the clown and the dancer have some neat moments, but the major has too much over-the-top bluster. He’s a bit one-note, and he’s the main character. We did really enjoy the characters working through all the obvious and not-so-obvious theories about where they were. It’s not a terrible episode, but it almost wears out its welcome by the end. The reveal (in case it isn’t obvious by now) comes as a relief, and doesn’t quite manage to be as creepy as it wants to be, although the final shots are well done.